This elegant bracelet started out as a plain black expansion bracelet on elastic cord. By taking the original bracelet apart and adding faceted fire-polished beads, you can make a new bracelet that will last much longer. And the best part is that there are usually enough beads in an elastic bracelet to make at least two new ones. Vary the color of the faceted beads you choose, and have fun! I've given you extremely detailed instructions below, so I hope you'll find this to be a good beginner project. 1. Cut the beading wire into two 10 inch pieces. Use alligator clips to keep the beads from sliding off as you work. Alternate stringing on a black jasper bead with an 8mm faceted round through both the top and bottom holes of the jasper beads. Slide a faceted rondelle onto each end. Set aside. 2. Use three headpins for each 3-holed spacer bar. Sandwich the bar between two 4mm faceted rounds, and create a wrapped loop with the end of the headpin. Make sure that the two outer loops face in the same direction, and that the middle loop faces in the opposite direction. 3. Attach two jump rings to the middle loop of one of the spacer bar assemblages. Attach a jump ring and a lobster claw clasp to the middle loop of the other. 4. 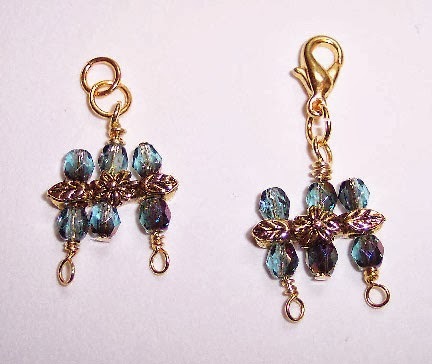 Use crimp beads to attach the bracelet wires to the outer loops of the spacer bar assemblages. Bury the wires in the bracelet beadwork and clip off the ends.